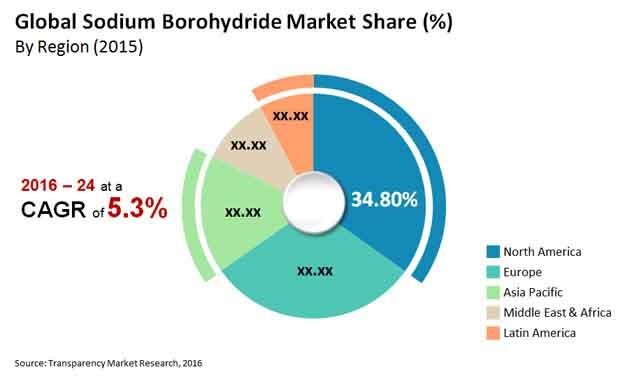 The global market for sodium borohydride has shown a consolidated market as the leading player Kemira held up to 38% of leading share in 2015. Montgomery Chemicals and Vertellus Specialty Materials are the other two companies that have a remarkable significance in the market. These companies put great emphasis on using advanced research techniques and various strategic marketing strategies, as analysed by Transparency Market Research (TMR). Thus, have the power to influence the marketing as per their needs, that has made the market consolidated. Moreover, these companies will significantly progress in coming time to enhance the product quality and availability and marketing strategies in new ways. According to the analysis done by TMR, it has been projected that the market for sodium borohydride will possibly create a value around US$ 2.1 bn by the end of forecasted period in 2024 that was US$ 1.3 bn in 2015. The market is also expected to expand at a CAGR of 5.3% during the forecast period. On the bases of end users, paper and pulp industry segment is leading the market with the increasing growth of packaging products. This segment may rise at a 4.7% of CAGR during the forecast tenure, as mentioned in the report. Additionally, the leading region in the sodium borohydride market is North America with the increasing popularity and growth of paper and pulp industry. This region is further expected to have a share of 34.5% by the end of 2024 at a global level. The market for sodium borohydride is increasing due to increasing demand from pharmaceutical industries, as they act as an important raw material used in making various pharmaceutical products. Increasing efforts in research and developments for antibiotics as a reason for growing awareness I n the healthcare sector. These are the driving factors that will boost the demand for sodium borohydride in the coming years. Additionally, the demand for innovative technology such as hydrogen on demand has significantly grown, thus making huge opportunities for sodium borohydride market in the coming years. Furthermore, expanding paper and pulp industry requiring sodium borohydride at a significant quality has contributed to increase the revenue in the market. Increasing demand for Electronic products and agrochemicals with organic chemical purification, textile, and metal recovery have contributed to grow the market. Regardless of various benefit of sodium borohydride and its astonishing performance in the global market. There are certain restrains that may hinder its growth during the forecast period. the use of sodium borohydride has various hazardous impact on health such as irritation on skin, eyes, and respiratory tract that needs to be taken care with which the market cold grow effectively. High prices are also increasing concerns for the market to grow efficiently. However, these restrains can be overcome for the market go grow at its full potential. High demand can be seen from emerging economies in Asia Pacific and Middle East regions.